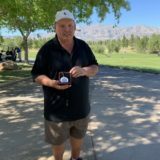 Incoming Southern Nevada Golf Association president Kenny Ebalo first became involved with the organization because of the quality tournament schedule, but has stayed involved–and additionally motivated–because be believes there is much more depth to the organization than solely tournaments. 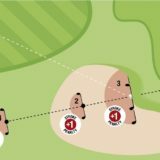 –By Brian Hurlburt, Las Vegas Golf Insider. Ebalo, the 2014 Championship Division Player of the Year, takes over the presidency from Tim Quinn in 2019 and looks to build on the improvements made over the last several years. He also wants to continue to spread the message of the SNGA throughout the community. “I have been excited to be part of the SNGA board for the last four years and it has been rewarding to watch so much happen under the leadership of Tim (Quinn) and executive director Ann Sunstrum and the rest of the executive board,” Ebalo says. “The SNGA has secured allied association status with the USGA, grown the membership, established a partnership with the Arizona Golf Association and so much more. A main part of my presidency will be to make sure the word gets out to the community about the good things going on at the SNGA. Among the goals Ebalo has set is to grow the membership by 1000 in 2019, something that he says is attainable because through digital programs and other advertising and public relations, the SNGA has grown by 683 members over the last eight months. Ebalo also looks forward to strengthening relationships with course owners and staff, golf shop owners and any other businesses associated with golf or that cater to a golf clientele and also with the membership. He also hopes his fellow SNGA members will help with spreading the SNGA message. Ebalo, a Southern Highlands member, is an accomplished player who plays a local and national schedule. In 2014 he won the Southern Nevada Amateur and the Nevada State Mid-Amateur and finished in the top 32 of the U.S. Mid-Amateur. He was a U.S. Mid-Am qualifier in 2018 as well. Ebalo has served on the tournament advisory committee and also the marketing and membership committee during the last several years and is ready to lead his new executive committee team that is made up of vice president Sue May, secretary Tom Khamis and treasurer Matt Johnson. 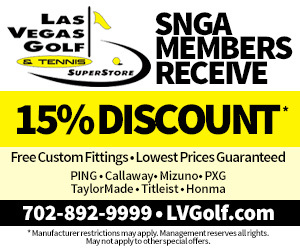 If you are not a member and reading this, click now to view the official membership information page and join the SNGA today and start saving on golf, travel, equipment purchases and more.